Few things say “medieval” quite like medieval armor. Medieval armor continues to fascinate and dazzle us, as evidenced by the abundance of movies and TV shows revolving around epic medieval battle sequences. There’s something intriguing about the shiny, interlocking metal plates, and at Pearson’s Renaissance Shoppe, the more we learn about medieval armor, the more we admire and love it! Medieval armor went through many different phases throughout history. Before the medieval period, the most common form of armor consisted of leather and chainmail. That certainly doesn’t sound like it gave much protection to warriors, but you have to keep in mind weapons were much more primitive in those days. As weapons evolved and became more sophisticated, so too did medieval armor. Chainmail became a more important part of armor. The tightly interlocked rings were extremely effective against weapons that could slash through ordinary clothing. Chainmail was used as armor beyond the medieval period – all the way through to the 17th century! As medieval warriors began incorporating weapons that relied on blunt force, a new, more protective type of armor was required. The first innovation came with the invention of the metal breastplate. The breastplate proved to be so effective during battle that the idea of using metal plates all over the body became the ultimate goal. Through some trial and error, a suit of armor was developed and soon became the standard way to protect oneself during battle. This new suit of armor became what we now think of when we hear “knight’s armor.” Technology kept improving, and new pieces were added to the medieval knight’s arsenal, like protective helmets and shields. If you are planning on dressing like a noble medieval knight at the next Renaissance faire, why not look as authentic as possible? At Pearson’s Renaissance Shoppe, we have a complete collection of period-authentic medieval armor. If you are looking for a suit of armor that represents the height of form and function, you need to see our German Gothic Cuirass with Tasset. 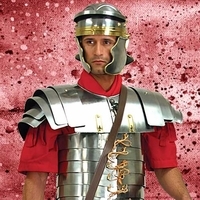 We also have an impressive replica of the Lorica Segmentata suit of armor from the first century A.D. Whatever you are looking for, you will find it at PearsonsRenaissanceShoppe.com!